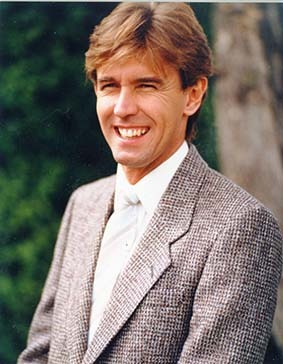 Elias J. “Lucky” Baldwin, cash in hand, opens the original Santa Anita Park racetrack, a few blocks east of its current location, in what is now Arcadia Park. At the time owns much of Pasadena, Sierra Madre and Arcadia. 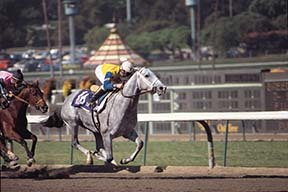 The inaugural running of the Santa Anita Handicap is won by Azucar. 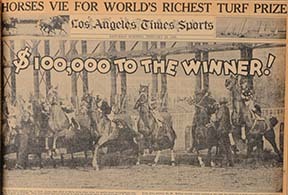 The race’s build up and running, with its purse being an unheard of at the time $100,000, makes front page news of the Los Angeles times. 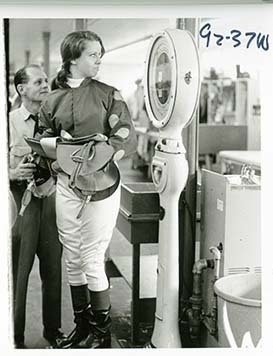 Tuesdee Testa becomes the first female jockey to win a race at Santa Anita Park. Spectacular Bid, with Bill Shoemaker aboard, has a perfect 1980 season. Santa Anita Park’s legendary announcer, Trevor Denman, joins Santa Anita and remained as its voice for 33 years before calling it quits at the end of 2015. 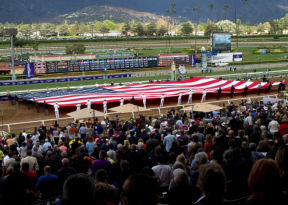 Santa Anita Park hosts its first Breeders’ Cup World Championships. This spectacular event features the world's greatest horses, jockeys and trainers on one stage competing for millions of dollars. It would be the first of many that Santa Anita Park would host. 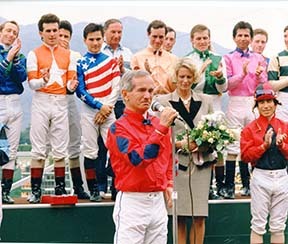 Bill Shoemaker’s last ride and farewell speech at Santa Anita Park. He was elected to the Hall of Fame in 1958 and had one of the most memorable careers in Thoroughbred racing. Filming of the movie “Seabiscuit” takes place at Santa Anita Park with jockey Gary Stevens playing the role of George Woolf. “Seabiscuit” in the film is played by Fighting Furrari, who still entertains fans at Santa Anita Park today. Zenyatta becomes the first female to win the Breeders’ Cup Classic hosted at Santa Anita Park, helping her remain undefeated. With that win she also became the first to ever win two different Breeders' Cup races and her victory is remembered by many as the greatest moment in Breeders' Cup history. The Great Race Place went through a makeover of over $15 million in renovations including a brand new Club House Mezzanine featuring new eateries and state of the art HD television screens. The iconic Chandelier Room was also redesigned along with the inclusion of the new Eddie Logan Suite. 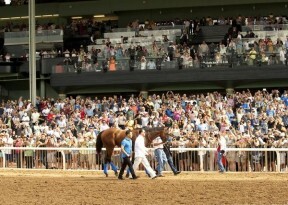 Triple Crown Champion American Pharoah returns to Santa Anita Park to parade in front of over 28,000 fans in attendance. American Pharoah became the first horse in over 37 years to capture the Kentucky Derby, Preakness and Belmont Stakes. 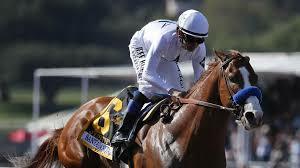 Justify wins the Grade 1 Santa Anita Derby en route to capturing the elusive Triple Crown, joining Seattle Slew as only the second undefeated three year old to do so. 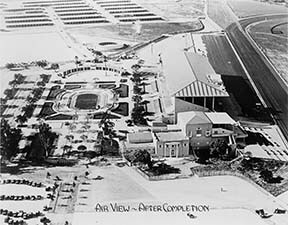 After the legalization of pari-mutuel gambling in 1933, San Francisco dentist Dr. Charles H. Strub and movie mogul, Hal Roach, create a new Santa Anita Park in its current location at the foot of the San Gabriel Mountains and find success despite being in the midst of the Great Depression. 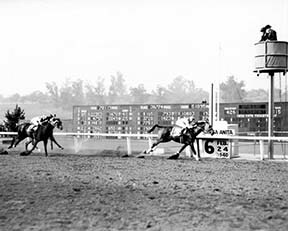 Seabiscuit wins the 1940 Santa Anita Handicap after two previous attempts; the magnetic starting gate is first introduced into the Santa Anita Park meet. 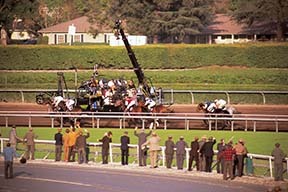 Affirmed and Laffit Pincay Jr. win the Santa Anita Derby to set them on their run towards the 1978 Triple Crown title. Affirmed would go on to claim all three Triple Crown races that year and win Horse of the Year. 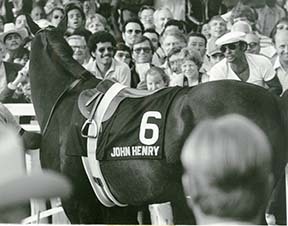 John Henry wins his second Santa Anita Handicap, and is hailed as a modern-day Seabiscuit. Both horses are now immortalized in the Santa Anita Park statuary. 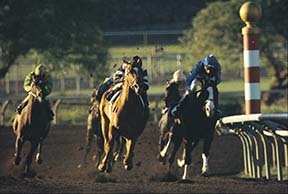 Santa Anita Park plays host to equestrian events at the 1984 Olympic Summer Games in Los Angeles, California. 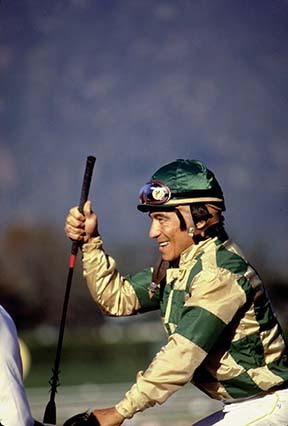 Hall of Famer Laffit Pincay Jr. wins seven races in one day. 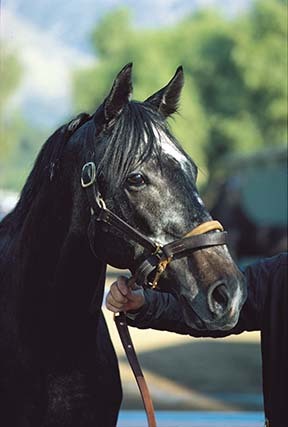 Legendary hornblower, Jay Cohen, joins Santa Anita Park and persists as its iconic trumpeter today. The opening of the FrontRunner restaurant. 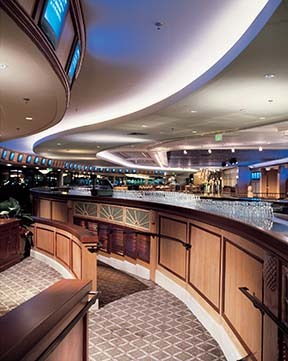 The FrontRunner sits atop the Grandstands on the 5th floor featuring a 215 ft long bar and a seasonally revolving menu. 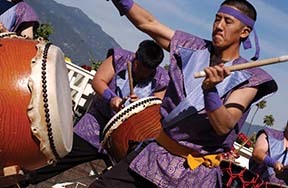 Introduction of the Tokyo City Cup at Santa Anita, a celebration of its sister track in Japan, Ohi Racetrack. 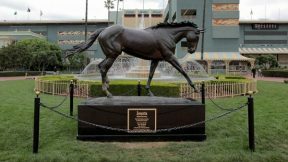 Zenyatta becomes one of three horses to be honored with a statue in the Santa Anita paddock gardens, joining 1930's star Seabiscuit and 1980's fan favorite John Henry. 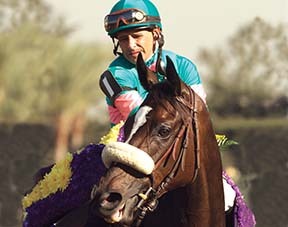 Hosted the Breeders’ Cup World Championships an unprecedented three years in a row. 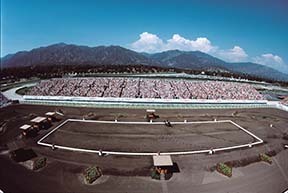 The two day event set a record in attendance and would be the eighth time Santa Anita played host to this world class event. Two tremendous battles unfolded in the 2016 Breeders' Cup World Championship hosted for a record ninth time at Santa Anita Park. Beholder wins the Distaff in a thrilling stretch battle over the undefeated Songbird. 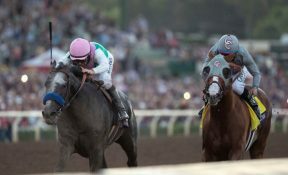 The Breeders' Cup Classic followed with an epic battle as Arrogate chased down heavy favorite California Chrome, surpassing his rival at the wire.